A large amount of Dubrovnik’s trade was with Mediterranean cities, all of them locations of thriving Jewish communities. Jews were tolerated as itinerant traders in Dubrovnik from 1352. With the expulsion of the Jews from Spain in 1492, some came and settled in Dubrovnik. Evidence of Dubrovnik’s Jewish history is revealed by Europe’s oldest functioning Sephardic synagogue. After Prague, it is the second oldest synagogue still in use in Europe. The synagogue was built in 1408 in a narrow three-storied stone building dating from the fourteenth century. Later, the city state of Dubrovnik unanimously decreed that the Jews should have a permanent living quarter in the city. The Ghetto was formed in 1546. Today, you can still see the street called Zudioska ulica (Jewish street) – check map here. The Jews of Dubrovnik did suffer occasions of persecution such as in 1502, 1515, 1571 and 1622 due to false accusations which in some cases led to executions. By the mid-18th century, as Dubrovnik’s economic position declined, the small community of Jews was prohibited from engaging in commerce, and was confined to live in the ghetto. However, French rule – lasting from 1808 to 1815 – gave equality to the Jews of Dubrovnik, annulling all prior restrictions. Although Austrian rule brought in new laws regulating their lives, full emancipation would occur towards the end of the century. Exiting the walled city, just outside the Pile Gate entrance to Dubrovnik, remains a little-known but unique Jewish site – a modest water fountain that serves the local population. Before Napoleon’s arrival to fortified Dubrovnik, Jews were not allowed to drink water from the other two fountains in the city. They were restricted to the “Jewish Fountain,” as it is still called today. When Napoleon granted Jews equal rights, all fountains were then accessible to them, and the Jewish Fountain was removed from within the Old City’s walls – but not from the area. It was kept in Pile as a permanent monument. 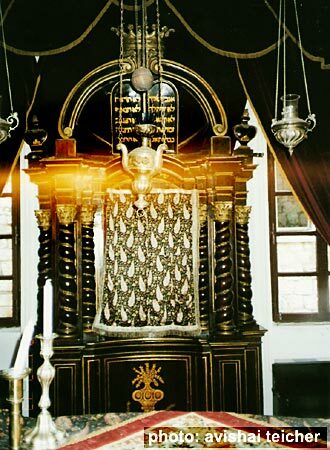 Although the synagogue survived the major earthquake of 1667, it suffered serious damage to its roof after being hit twice during the Yugoslav shelling of Dubrovnik in 1991. Repairs were completed by 1997, and the synagogue was again fit for use.